The Tampa Bay Rays on Tuesday showed off plans for a new domed baseball stadium in the Ybor City neighborhood of Tampa, and they and area officials are banking on community excitement to help draw funding for it. 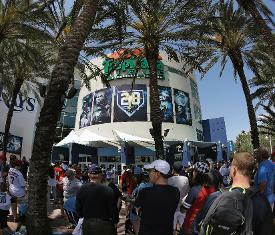 Melanie Lenz, the Rays' senior vice president of strategy and development, promised the venue would be "a ballpark experience like no other" and not a stadium, but "a neighborhood ballpark." Among the features of the plans for the stadium, which could be built and open for business to start the 2023 season, would be a fixed translucent roof and sliding glass walls. Design officials called the sliding walls a chance to "let the outside in and the inside out." The stadium would seat 28,216, about 5,000 fewer than Tropicana Stadium in St. Petersburg and smaller than any current Major League park. Capacity was listed at 30,842. No plans were announced to cover the cost of the stadium and surrounding infrastructure, estimated at $892 million. When asked about the funding, Rays team president Brian Auld said, "We don't have those answers yet." Figuring that out is one of the next steps, team officials said. "We believe baseball can not only survive but thrive here in Tampa," principal team owner Stuart Sternberg offered. "We're confident, we're committed and we believe that we can get this done." Many have emphasized that selling the public on the stadium will be important. "It's about creating and developing a buzz around this and to get some community buy-in," Tampa mayor Bob Buckhorn said Monday. "Folks want to see it and imagine it. It makes the job of building support that much easier." Buckhorn compared the Rays' announcement and officials' enthusiasm to being "like a first date. Now we have to decide whether we're going to fall in love. If it doesn't make sense to the good of the community for the long-term, we need to be prepared to walk away." The Rays have a lease at Tropicana Field through 2027 but have a separate contractual right to negotiate an early departure, with the least buyout cost coming if their new home is still in the Tampa Bay area. That contract expires Dec. 31. The Ybor City site, not far from the Port of Tampa, covers some 14 acres. It's within the growing Channelside-Ybor corridor and not far from Water Street Tampa, a planned overhaul of Channelside led by Tampa Bay Lightning owner Jeff Vinick. The Rays have played in St. Petersburg for the entire 20 years of their existence. They announced plans in February to move to Tampa and build a new stadium.